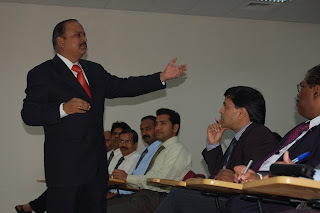 “There are two kinds of speakers in this world: those who are nervous and the others who are liars”, quoted Mr. Chendil Kumar to his thrilled audience who were all geared up for the Communication Workshop organised by the Department of Engineering, Manipal University Dubai, on the 29th of November. 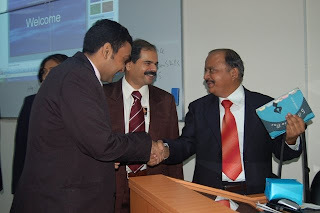 T. Chendil Kumar, a trainer, teacher and a Toastmaster, originally from Karnataka, was invited on behalf of the Department to speak about: Effective Communication Skills, to the students perusing the course and various members of the faculty at the University. Speaking on the ability to connect, Mr. Kumar said that the process consists of three important elements: Intent, Content and the Impact. Clarity is an important factor in any communication; the source must be clear about what he or she actually wants to say, the content of the message should be as accurate as possible in order to send across the same meaning to the audience as intended by the receiver and last, but not the least, impact the message has on the receiver. The secret that lies behind being a good communicator is to be humble, to learn, unlearn and relearn things and the attitude of the communicator, which makes any communication successful. On the topic of fear of public speaking, or the ability to communicate and express oneself in public, four things should be kept in mind and worked upon as individuals; Competence, Confidence, Communication Skills, and Conscience. One should never feel inferior while speaking in public, of course mastering the language in which you intend to communicate is very vital. Mr. Kumar also gave the audience tips on various methods to communicate a message successfully and also to be a good public speaker. The interactive workshop came to an end with the Vote of Thanks by the Chairperson of the Department of Engineering, who whole-heartedly thanked the speaker for enlightening the audience with his golden words.